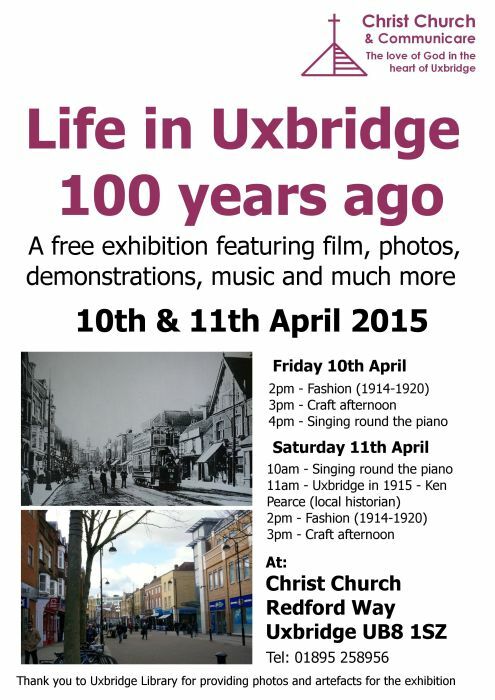 On Friday 10th April 2015 and Saturday 11th April 2015, Christ Church will be hosting the “Life in Uxbridge 100 years ago” exhibition – a free exhibition showing the kind of place Uxbridge was a century ago through sound and vision. There will be film, pictures, artefacts, demonstrations, music and much more. You will be able to try for yourself the games, toys and crafts of the time. There will be food available on both days including afternoon tea on Saturday. Thank you to Uxbridge Library for all their help with providing photos and artefacts for the exhibition. This entry was posted in Event and tagged exhibition, history, uxbridge on April 1, 2015 by admin.